Last week I mentioned how having Xyd along for the ride on the hosted server was interesting in that I got to see how somebody else approached the game, built things, and, in his case, dealt with the nether. Late last week I managed to get Potshot to buy into Minecraft and come take a look at the world in block form. I got him whitelisted as Skronk on the server and met him at the spawn point. From there I walked him around some of the basics that I thought would have helped me had my daughter not been rushing ahead and assuming I knew what she was talking about. For me that included some of the basics of moving and equipping things, the whole “right tool for the job” mantra that permeates the game (which is a very Y chromosome thing for me, the whole “sure, you could use an adjustable wrench, but it is really best done with a pneumatic torque wrench!” view of the world), the need to eat, and why you need to go inside at night. 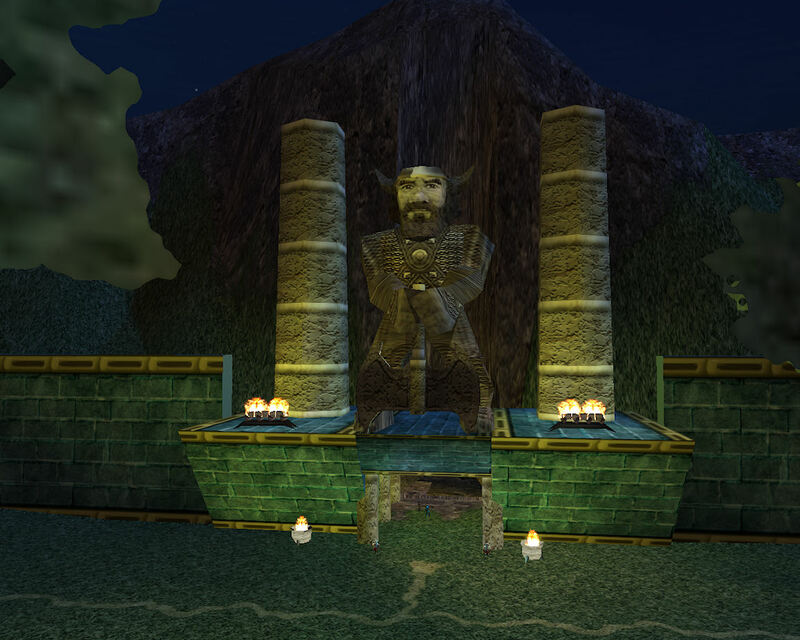 That was quickly done and, after a tour of the house my daughter built way back when we started (which is still the most practical structure I’ve seen in the game so far), we picked a direction that had not be explored or exploited that I recall… which was south… and headed out to look for a likely location for a new home. After running into what felt like the wilderness, well out of sight of anything I had built or explored, night started to loom. However there was a likely hill ahead of us which Skronk decided to claim as his own. We built a shelter there, I did a briefing about crafting, sent him a link to a page with recipes, started a mine, threw torches around, made a couple beds, then had to log off, leaving him to his own devices. I got up the next day to find an email from him indicating that he was clearly into it because he stayed up late working on his new home. When I logged in I was surprised to see just how much he had done. Seeing that he was clearly invested in his new location, I went back to the spawn point area where we started off and began yet another public works project, building a cobblestone road, straight as an arrow, to his fortress. Little trails of torches and such are fine, but I prefer a nice, straight path to follow to keep me headed in the right direction and to minimize the whole “up and down every hill” along the way. 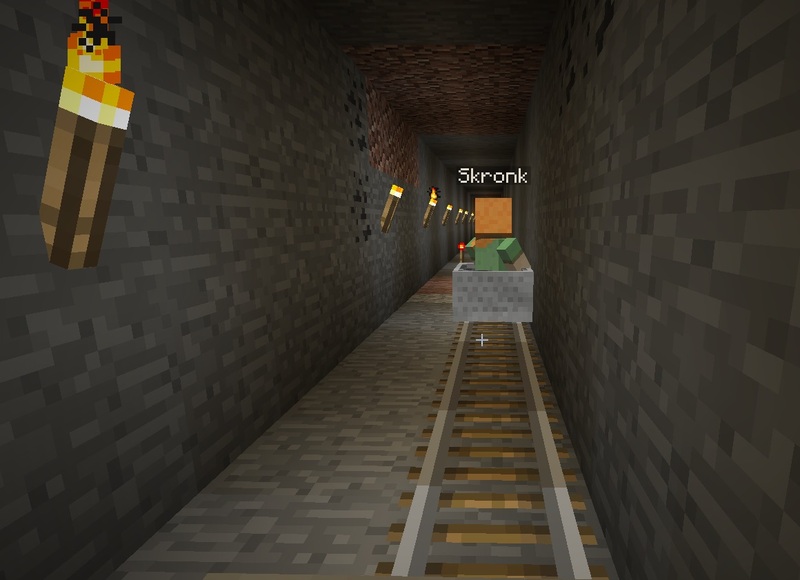 And, of course, once I had dug and then laid a two block wide road to just outside his compound, I figured I might as well used some of my hoarded iron to build a mine cart track to make the trip quick and easy. So when he got back on I was able to add “riding the rails” to the list of things he had done. After that he went back to work on his domain, carving out the interior, digging a tunnel out to the small train station I built, and even revising his whole front door to accommodate a change of vision. 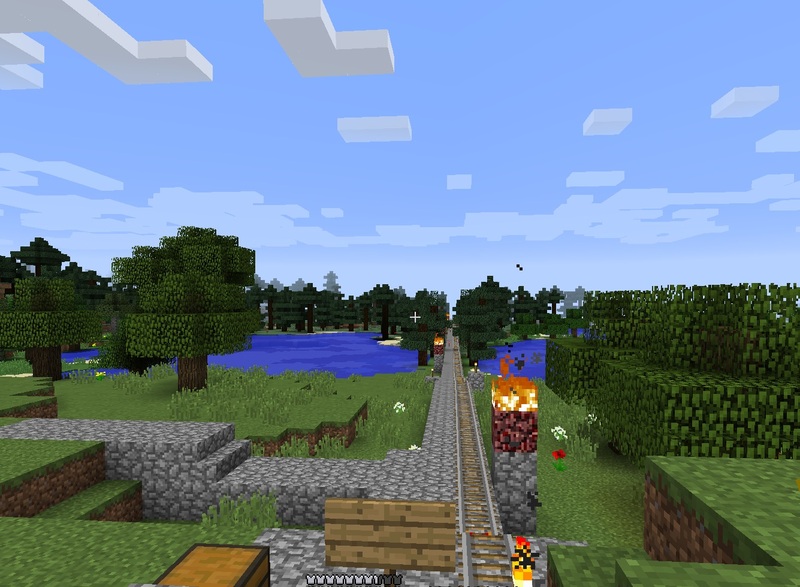 And now that I had a rail line it was easy enough to measure the distance he had gone from the spawn point. His dwarf fortress ended up being about a half a kilometer from the spawn point, which is not all that far. As somebody noted in the comments previously, the close horizon, along with the accelerated day/night cycle does mess with your ability to judge distances. Add in a forest that obscures your view at times and there often being a lack of distinct terrain features and you can travel a short distance and still feel like you are way, way out in the boondocks. How close that was became apparent later on. 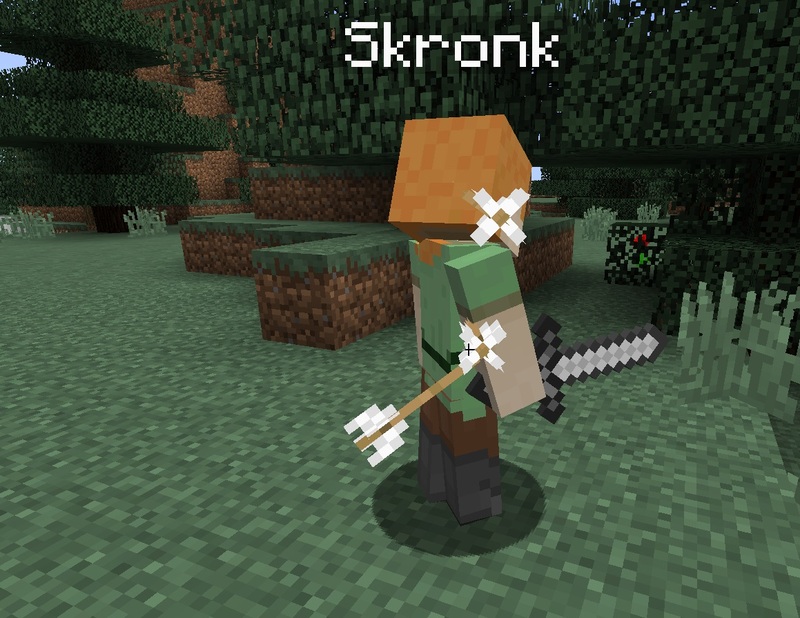 Skronk managed to hit a pocket of zombies at died while searching out a nearby cave system for iron. Iron is forever in short supply. I had to go back to mining after having expended the iron to build the latest addition to our local transit system. I ran over to help him try and find all of the stuff he dropped when he died. Again, lots of iron at stake. The search was fruitless and eventually he took it as a loss and a lesson and went back to work. I had logged off down in the caves and when I came back decided to give the area one more look, not being sure how long things persist in Minecraft. Sometimes items on the ground seem to vanish quite quickly while at other times I have found things… especially experience globes or saplings from a cut down tree… where I left them a day later. Anyway, in doing this I got well and fully lost. Add into that I was running out of torches and my pick was nearly done in. Fortunately I was left with the usual option when lost underground, which was to simply dig up and out. I found a high spot and started to stair-step my way to the surface, emerging on a hillside. Looking in one direction I could see Skonk’s keep in the light of the setting sun. And looking the other way I could see the village back where that sheep stole my mine cart, which really put the whole location into perspective. 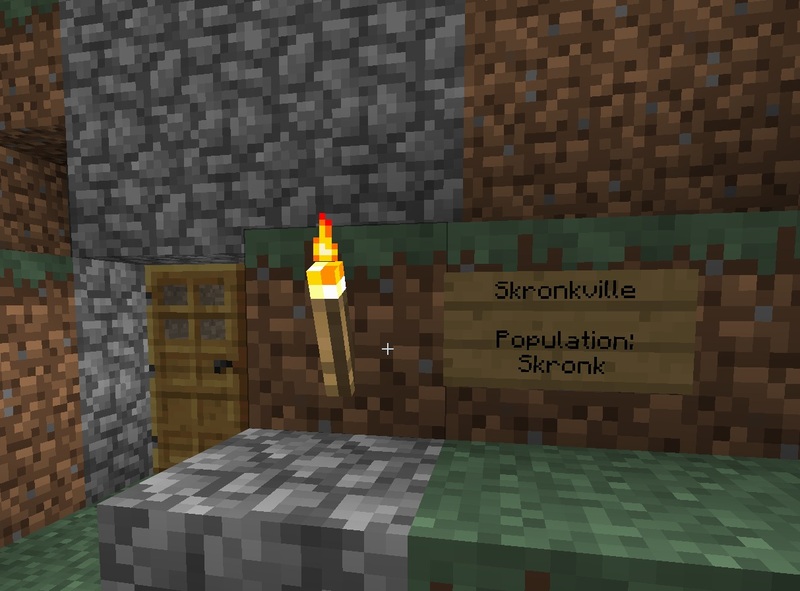 I could have, I suppose, just extended the village rail line and hooked up to Skronk’s home, though that would have meant moving along a diagonal line in a world that really doesn’t like that sort of things. A large “L” shaped track from the village to Skronk’s would have probably used as much rail or more as the line I already built. So there is Skonk in his own area yet still in the neighborhood. 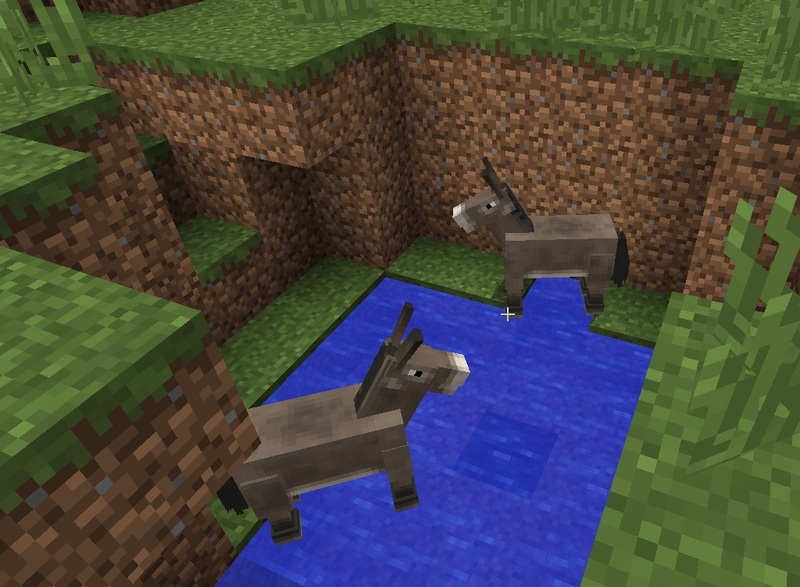 He even has some donkeys in the vicinity to tame, the first ones I had ever seen in game. Now though I am a little worried about the village. I went to visit it and found that the number of villagers seemed to have decreased rather dramatically. There were 8 or 9 villagers running around before, but I could only find 3 when I went over. I suspect that the cave mining operation is close enough to the village that it is seeing night time spawns that could be killing them off. I’ll need to go over and light the place up more thoroughly. My daughter also suggested sealing up the village completely, dispensing with the doors I put in the walls, left villagers wander outside the compound after dark. But now I get to see another person’s approach to building in Minecraft. Xyd, so far, has been mostly underground and very practical in his efforts. Skronk is also hollowing out the earth for his home, though on a much more grand scale. And I continue to build almost exclusively above ground, descending into the earth only to mine or tunnel paths for travel. The upshot of which is that I am always running out of cobblestone while Skronk complains of having an excess. There might have to be a trade agreement on that front. Then on Saturday evening Skronk’s wife, in the guise of Enaldi, joined us, though she insisted on picking a suitable skin before logging in. Princess Leia ended up being her pick. She caught up on the basics, road the mine cart track, and will no doubt be making her own mark on the world in the days and weeks to come, another vision to see. 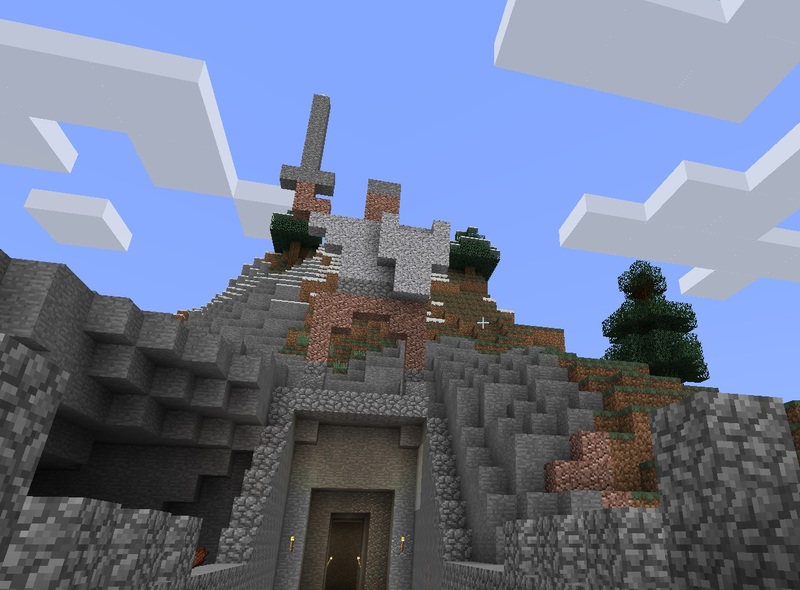 Which is one of the interesting aspects of Minecraft as a multiplayer game. Given the freedom offered, people will end up stacking blocks in their own way. This entry was posted in entertainment, Minecraft and tagged Skronk on August 18, 2015 by Wilhelm Arcturus. We found a village in the server I share with my older boys, and within a day or two, we also noticed population bottoming out. My boys also noticed an uptick in zombie villagers around that time, so we think we know what happened, being capable of putting two and two together. I subsequently walled in the village and nightly will now find 4-6 zombies standing crowded at the wall nearest one of the houses a villager is in. Supposedly you can get them to have baby villagers by giving them three loaves of bread, which I tried, but this has not had any effect that I can see yet. @Fenjay – Villager population is a function of “valid doors” in the village, breeding is a function of how much excess food they are carrying. The wiki explains valid door calculations (clear sight to sky on one side of the door, covered on the other), the easiest way to boost that number is to add a bunch of exterior doors to their housing, ensuring there’s flat open space for a few blocks in front of each door (or you can go nuts with a step pyramid built mostly of doors and block layers). Food wise, just build and plant a bunch of fields right next to their housing, if you are regularly working near that world “chunk”, they’ll feed themselves and catch up to the population the number of doors suggest. I’m really fond of observing how others (and me) build in these types of multiplayer worlds, be it Minecraft, Terraria, Landmark, Don’t Starve or one of the many crafting sandboxes out there. I find that I tend to be on the extreme side of functional, very spartan, kind of like Xyd, dig little hobbit holes under the earth (much to Eri’s amusement in Terraria) or rectangular buildings/rooms whose main purpose is to fulfill a function – house some machines, a storeroom for chests of resources, a convenient farm/artificial biome for having resources easily on hand, etc. 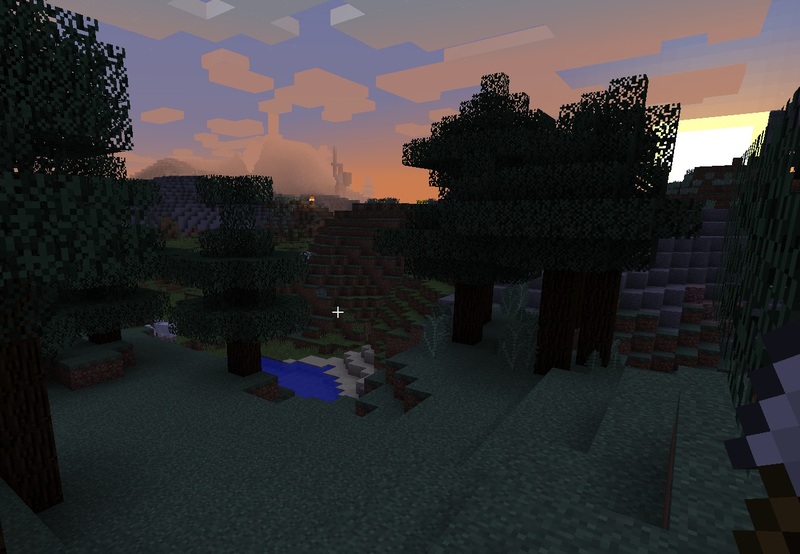 Interestingly, especially in Minecraft, I find myself not wanting to mar the natural scenery/sense of immersion and will patiently wind my way around various landmarks while exploring. Only when I decide I will be visiting the place very often, do I consider the straight road highway option. My build style is pretty close to Jeromai’s. The first base is usually just a burrow in a hill, which I then expand underground. I’ve found that using standard measurements makes it much easier to line things up when connecting different parts of the base and to add decorations like torches or lamps at regular intervals. My standard-issue room is a 5x5x4, with the walls made of stone bricks and the floor and the roof made of planks. That gives enough room to hide the wiring behind machines without impeding movement. And in regular corridors, it leaves enough room to add arches that are high enough that you don’t bump your head on them and wide enough that the pillars don’t make you feel claustrophobic. That building style works well underground, but I admit that it produces rather bland exteriors. Above ground, I tend to add crenelations, lots of windows and pitched roofs. And if I have a spider problem, I add overhangs to prevent them from climbing on the roof and ambushing me from there whenever I go out in the morning. @TheGreatYak – that’s great advice. Thanks! I knew (in a hand-wavy sort of way) about valid doors, but didn’t put together that it was the key to village population. The discussion of it on the (official) wiki quickly descends into technical definitions instead of practical advice.